Integrity, Quality and Value, these are the core concepts that serve as the foundation of the Sposen Signature Series culture and brand. They are the guide for our decisions, design, and craftsmanship. We are forever relentless in the pursuit of customer, product & employee excellence. Before partnering with EZ Rankings, Sposen Homes attempted to get an online reputation in the USA market, they require an Online Reputation Management firms to promote their Name in Cape Coral, Fort Myers Florida USA. However, the results did not meet expectations. 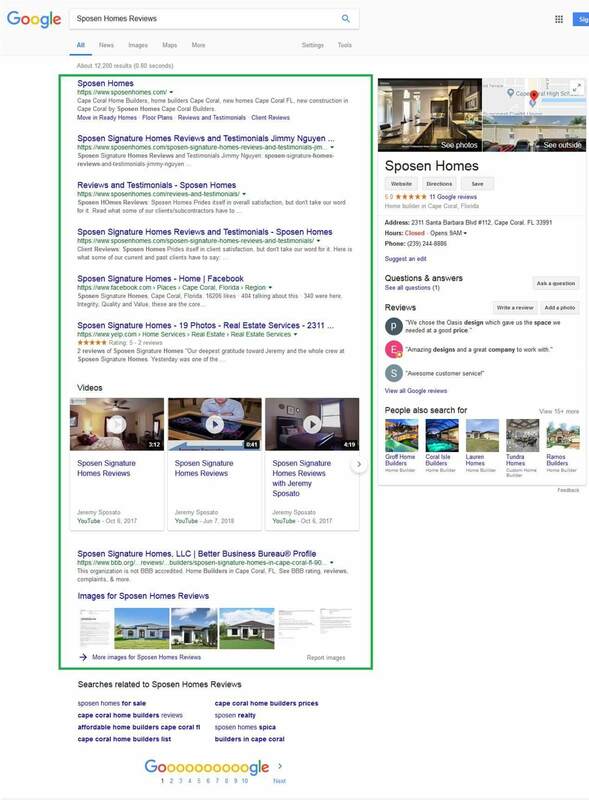 Sposen Homes required the right combination of marketing knowledge and digital media experience to remove negative reviews from the SERPs as well as boost its brand presence. EZ Rankings comes with a game-changing solution to meet the objectives of the client.